Here is your opportunity to meet author and paranormal researcher James Willis and members of his nationally recognized investigative organization “The Ghosts of Ohio.” The Greenville Public Library is partnering with St. Clair Memorial Hall where this fascinating program will be held on Thursday October 19th at 6:00 p.m. Free tickets can be picked up at the Reference Desk at the Library or at the door at Memorial Hall. Get spooked as they share audio, video, and photos from some of their favorite hair-raising haunts ...some of which might be in your own back yard! Don't miss your chance to hear some strange and unnerving stuff recorded during a visit to a famous Greenville location. A book-signing will follow the presentation. 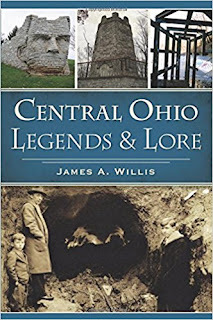 James has written over a dozen books on the subject including Ohio’s Historic Haunts: Investigating the Paranormal in the Buckeye State, The Big Book Of Ohio Ghost Stories, and Central Ohio Legends & Lore. Check out his blogs where he posts monthly updates as well as archived stories of research from 2010 to present with sights, sounds, and a big dose of humor and horror! strangeandspookyworld.com and ghostsofohio.org.